These days, about 20% of all marriage ceremonies take place away from the hometown of the bride or the groom. Given our great weather and beautiful backdrops, it’s no wonder that lots of couples are getting married in La Jolla. It’s posssible to have your ceremony in a public park, on the beach, or in a private home. Cuvier Park, also called The Wedding Bowl, is a small park located at Coast Boulevard and Cuvier Street in La Jolla – directly across from the San Diego Museum of Contemporary Art (see photo). The park site is about five steps below street level, which provides some privacy from passersby. It is the most popular spot for weddings along the La Jolla coastline. Darlington House, a beautifully maintained historic villa between the village and the ocean, can be rented for wedding ceremonies and receptions. 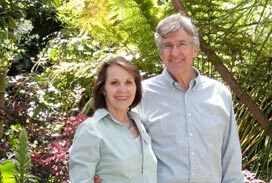 I’ve attended many events here and always enjoy the rich Spanish décor that includes patios surrounded by colorful flowers – complete with Roman arches and tiled benches. However, my favorite room is the handsome library, inspired by Moorish architecture. The Martin Johnson House on the campus of Scripps Institution of Oceanography at UCSD is a wonderful old world cottage on a rise that provides a stunning ocean view. Scripps Seaside Forum is also on the campus of SIO but, in contrast to the Martin Johnson House, the Forum is brand new and offers a beachfront location. If you need more information on wedding or reception venues, please feel free to post a comment. I want to help you have a very special day in La Jolla. 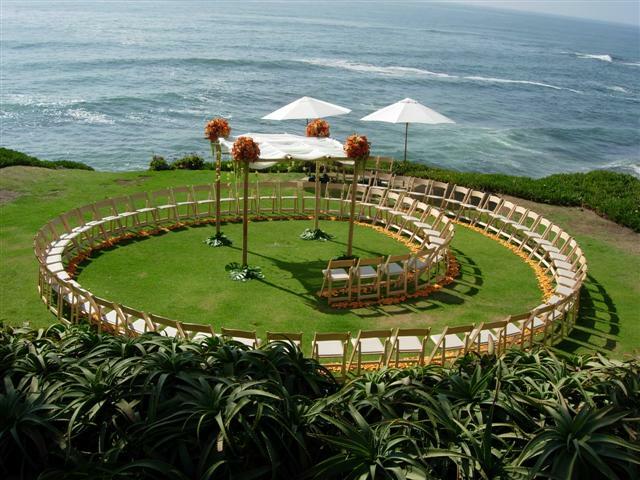 I am in love with the la jolla wedding bowl, and really want to have our wedding there. I was wondering in this picture who the wedding planner was or who set this up? I am from Idaho and need some recommendations of beautiful, yet affordable flowers, officiant, quartet…for everything! I am just getting started, and don’t know where to begin! I suggest you Google “wedding consultants La Jolla” and see if you can find a fit with one of those companies. This is lovely. La Jolla is one of my favorite places in the world. I thought the setup was so creative for this wedding. It looked like a shell to me, which was very appropriate, in my opinion, because the wedding was on the beach. Thanks for sharing! We are planning to get married this summer, and if you could let me know the specific coordinator who set up your ceremony layout, I would appreciate it. We are living in the UTC area of San Diego. I’m so sorry I don’t know who set up the chairs in the spiral, but I will try to find out. More later…. Thanks! Also, if you could provide the contact person for the center piece and flowers, that’d be great. I can provide you my email if you don’t want to publicly post here. I think you could show the picture to any party rental company and they could arrnge the chairs this way. One of San Diego’s best-known companies is Abbey Party Rents(tel.888-252-1319 or 858-454-3333). As far as florists are concerned, La Jolla’s best known is Adelaide’s on Girard Ane. (tel. 858-454-0146; http://www.adelaidesevents.com).